“You’re really looking stellar”, Dr Rossetti said to her. And she was very happy to be feeling as well as she was feeling. Her blood numbers were all normal, and have been for a while. (I’ve reproduced some numbers from her blood chart nearby). Notable was the Hemoglobin level of 13.7, and the fact that her protein levels are back to normal. That made her happy. The biopsies taken from last week’s procedure “looked good, with no significant evidence” of anything serious. She’s still got “a touch of chronic GHVD” (graft vs host disease). The Budesonide she’s taking “topically” deals with the symptoms she’s experiencing in her GI tract. It’s probably the best possible worlds that she’s got these mild GVHD symptoms, which are well controlled. What she’s got now is probably what she’s going to get at this stage. (GVHD is pretty much brought on by DNA/HLA mis-match with the donor. So the extra lengths they went to, in selecting a donor, are helping tremendously right now). At this point the possibility that she will get further symptoms is about 30% (not 50%, which is typical in the case of having unrelated donors). She’s still susceptible to infections, although she’s gotten the primary infections that they look for. None of them were serious, but she had “a moderate amount of everything”, and that indeed was life-threatening. But she continues to take an anti-viral infection drug, and her chances of bacterial infection are “way down”. It was a good report yesterday, after a number of months of bad times. I talked with Dr Rossetti yesterday, and yes, he had seen all of these symptoms that Beth was experiencing, no, none of them, taken alone, is all that serious, and yes, all of these taken together have weakened her and will likely make her recovery somewhat longer. That said, she was feeling a bit better yesterday and this morning, though the clot is still a worry, and her hand had swelled up a bit more. By the way, did you notice her smiling in this photo? She has always smiled nicely for photos, and she did so here, even though she was dreading the thought of having another central line put in. This one was her third, plus the clot-inducing PICC line in her arm. Finally, I had a chance to sneak Dani into the hospital for a few minutes last night. The policy is “no children under 12” in the room, though even Dr Rossetti has allowed us to break that rule on occasion. Still, it made for a nice moment for both girls. I had a chance to talk at length with one of the “practice” doctors (in Dr Rossetti’s practice) about all of this stuff that’s going wrong with Beth. 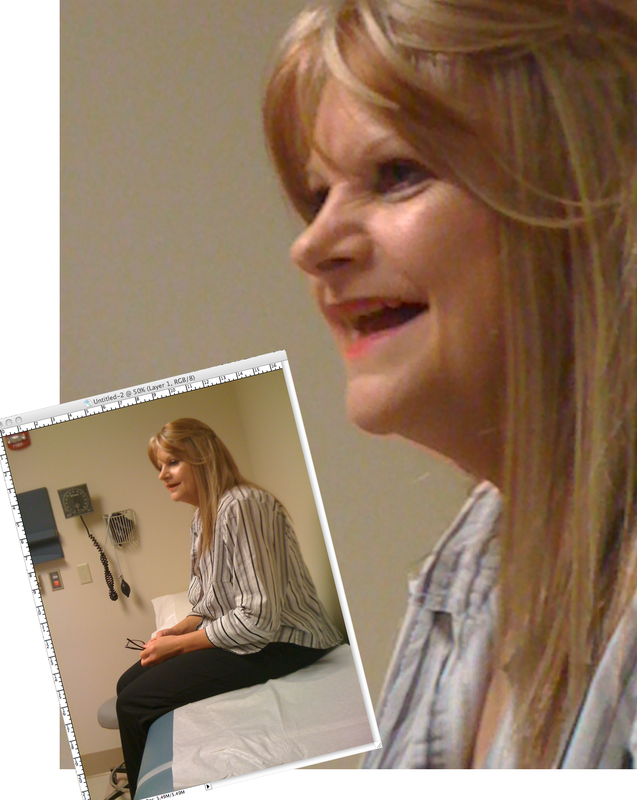 The symptoms she is experiencing are loosely related (because they are typical for some transplant patients). But even when you add them all up, they’re not too serious. She is experiencing some pain, but a we’re just seeing a bunch of loosely related nasty things. BK Virus: I had thought this was going to be the biggest threat, but the doctor said it’s not. It’s definitely the most annoying and painful, and there is a chance for it to head up to the kidneys and cause some damage there, but it is minimal. This is what causes the frequent and painful urination. They’re continuing to give a lot of IV fluids to flush the virus out. Her urination is still painful, but an ultrasound just revealed that her bladder is emptying – urine is not backing up, which is good. CMV Virus: This is the more serious of the two viruses; it is being treated with Ganciclovir, and the numbers appear to be going down. The swollen legs: This is partly from the fluids, but partly because she isn’t eating enough protein. It’s the same kind of effect that we used to see in the big bellies of the starving kids in the World Vision commercials, except that it’s happening in her legs and feet. MRSA: This is probably the least of her problems. She has some degree of ability to fight infections, and it doesn’t really come up as a problem. The clot in the arm: There are two places where a clot could form: at the end, which is more serious (because the end reaches into the large artery that enters the heart), or somewhere nearer where the catheter enters the vein (the plastic is causing irritation). It is also incredibly swelled and very painful. 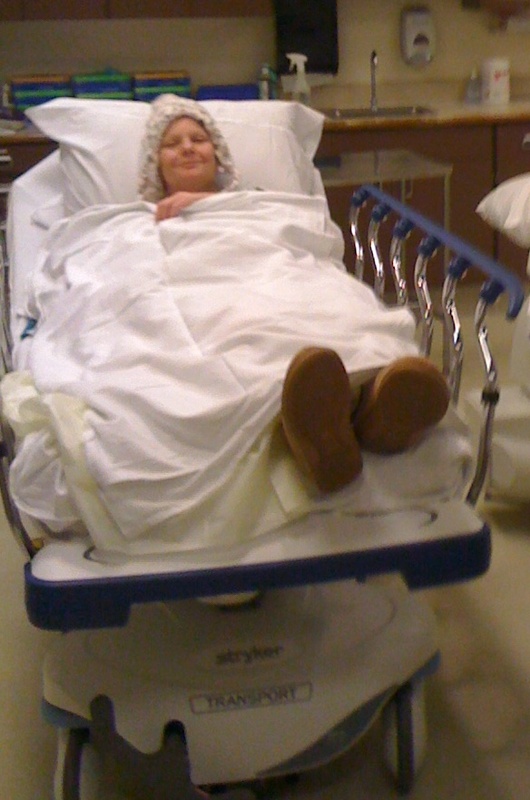 They are giving her a mild treatment to dissolve the clot. That’s a summary of what she’s facing. It’s all very painful and annoying, but no real danger to her health at this point. The last time Beth was in the hospital, I took Dani and Sissy both to see Beth, and with Pastor Matt and me in the room, along with Dr Rossetti and a nurse, it was pretty much a full house, and no one was any worse for the wear. Except that, it’s not policy to allow children under 12 into the room. My church had given us some gift certificates to purchase items at their second-hand shop called The Common Thread (which is scheduled to close at the end of the month). The Common Thread is just down the hill from the hospital, in Lawrenceville, and so I made plans to drop Dani off at the hospital – the girls were going to have a coloring day – and I would run down the hill to see what I could find. Well, not long after I got down to the store, I got a couple of calls and messages from Beth – they were asking Dani to leave, and I had to go back up and get her. Beth was heartbroken. I had picked out a couple of hats for Beth – one she likes very much, and it will be very helpful for when she loses her hair. I got some jackets and pants for my son John (who is just turning 16). And I got some work shirts and a very nice sports jacket for myself. Dani is extremely close with her mom. The two of them are like momma and baby duck. So it was pretty sad to have to take her home. Last night, I spent the night in the hospital, and I think I’m going to do the same tonight. I’ve eaten a bit and I’ll grab my bag and go sit with Beth while she gets her chemo. So far, it hasn’t affected her too badly. That is, she’s still complaining about the catheter. The incision is still sore, and the tape pulls on her skin, and it makes her itchy. Likely I’ll grab some sleep in between the nurses running in and out. The older guys are all home tonight. No one else is going anywhere. So I think I’ll finish up some laundry, and head back down to West Penn. The photo here shows Beth getting herself measured in Radiology. Including consultations with a doctor, a nurse, and a radiation therapist, we spent about two hours or more down there. 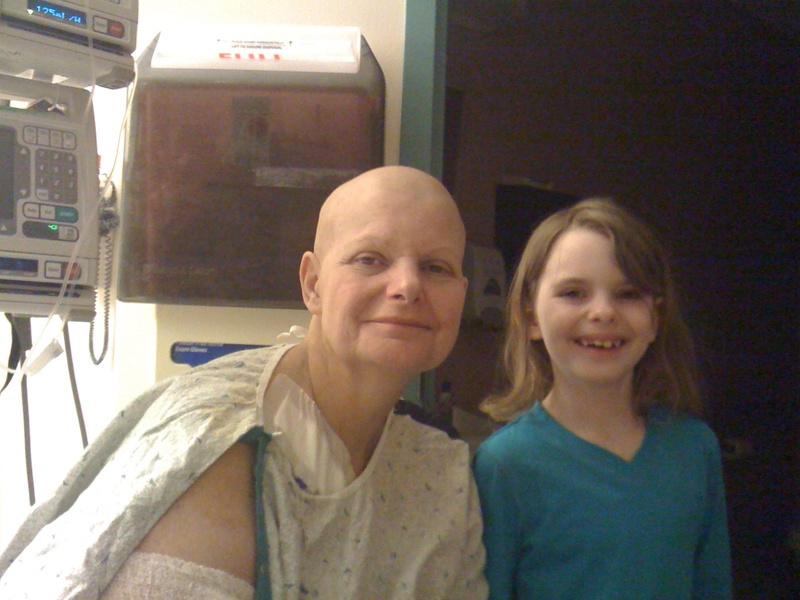 Beth will get two days of “total body irradiation” the last two days before the transplant. Dr Rossetti had told us that the radiation reduces the chances of a relapse by some 20% or more. Right now, I view the relapse as my biggest fear. You can’t see it from the photo, but she’ll stand at this board that she’s on; she’ll be strapped in, and they’ll bring the big “Radiation-generator” thing right up in front of her. 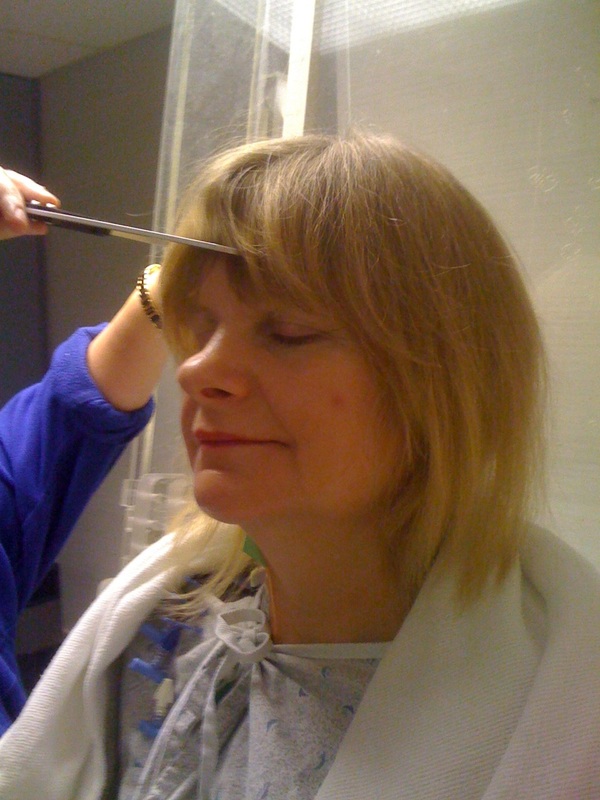 These measurements will allow them to adjust the amounts of radiation at parts of her that are thicker or thinner. She’ll have two 20-minute treatments – 10 minutes on one side, then they’ll flip her over and irradiate her 10 minutes on the other side. The clear benefit of the procedure is to finish off any of the damaged bone marrow that’s left in her body, after the chemotherapy has had a chance to do its thing. Aside from that, we went through the admission questionnaire – it’s pretty thorough, and for the first time, today, I saw a lot of these “history” questions being entered into a computer. Most of the time, they get hand-written on a piece of paper and stored away in a chart. She also got a treatment today called the “IVIG” treatment – it’s not a chemotherapy, but it’s supposed to enhance her ability to fight off viral infections, even as the Fludabarbine suppresses most of the rest of her immune system. She’ll get her first course of that tonight; she’ll have five days of the Fludabarbine and then four days of Busulfan. And she slept a lot, in between.